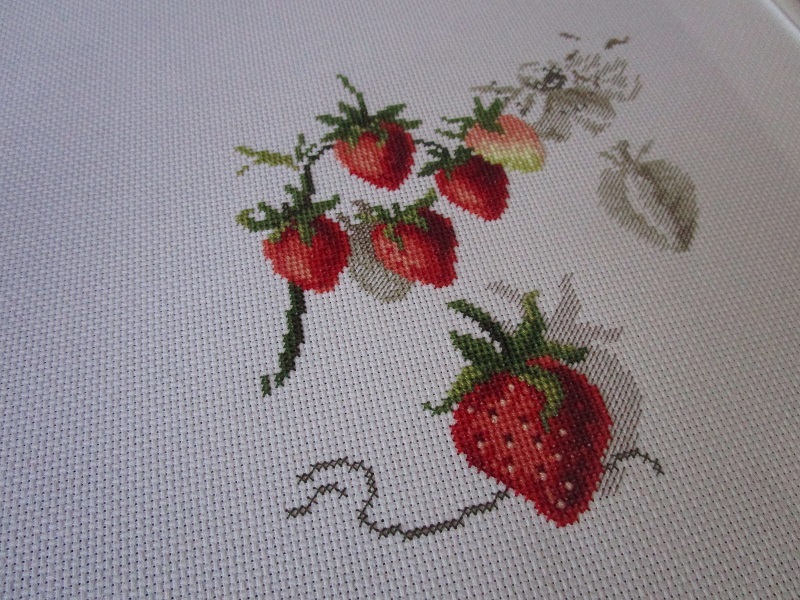 - Tangled Threads -: More strawberries! This week I have been working on Etudes aux Fraises. But can you believe that I still can't find that one elusive thread colour? 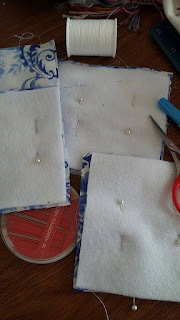 Luckily I have plenty of stitching to continue with before I have to go into panic mode about one single thread colour. I'm hoping that my local craft store will re-stock that colour soon, as I really don't want to have to order it on-line.....I hate paying postage, especially for one single item! ....I have actually sewn two......one where I followed the instructions from Pinterest which I didn't really like and the second time I just did my own thing. Hopefully I can complete this project and end up actually liking my sewing machine! Needless to say, I'm looking forward to the crochet part of this project. So this week, it will be back to working on the cute kitty design with the dreadful pattern, and trying to master the sewing machine.....wish me luck! Lovely progress. 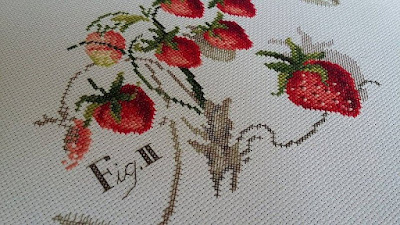 I love the 3D effect from the grey backstitching. 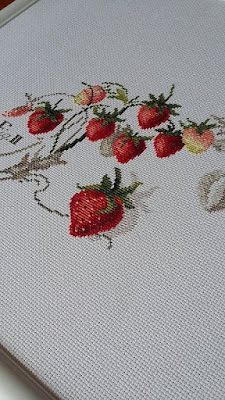 The strawberries are coming along beautifully! Strawberries looks so good. 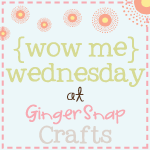 Looking fwd to results of your sewing machine adventures. The strawberry design is just beautiful, I love it! Well done on your sewing too...you will soon be making all kinds of things now! Have a great weekend. Your strawberries have really grown! Such an effective stitch. I don't get on with my sewing machine either, good luck making friends with yours! 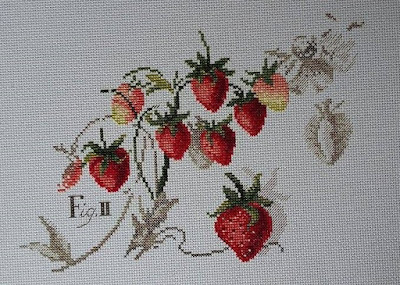 The strawberries look wonderful, the shading is so lifelike. You are really challenging yourself with the chart and the sewing machine too! Hope it all works out.